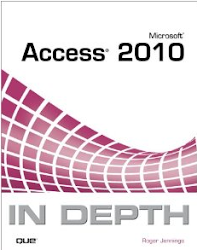 A blog about my "Microsoft Access 2010 In Depth" book (QUE Publishing, 2010) and advanced Access data management and programming techniques. I am pleased to announce that I will be presenting at the SharePoint Summit on January 31st, 2011 in Toronto. If you are looking for information on Access Services from the SharePoint administrator point of view (vs. the Access developer) then this session is for you. I've updated all 1,500 pages of Special Edition Using Microsoft Office Access 2007 to Microsoft Access 2010 In Depth for QUE Publishing. This is the 12th edition but has a new series title.